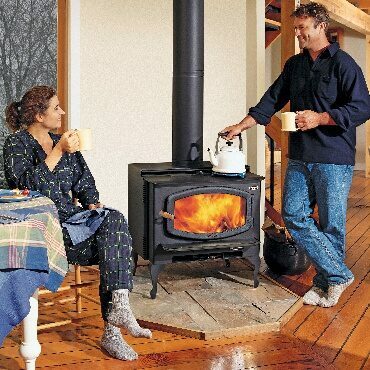 The beauty and grace of the Olympic wood stove is matched only by its remarkable efficiency and heating capabilities. This is a big stove that's big on heat! At just 2.6 grams of emissions per hour, the Olympic is one of the cleanest-burning EPA-certified large wood stoves on the market. Its huge firebox can hold logs up to 24" in length and provide burn times up to 12 hours. It also features a single control to adjust heat output and a bypass damper to prevent smoke spillage while starting and reloading. In addition to several leg styles. And for maximum convenience, the Olympic features a spacious cook top surface.